Not all sweet treats have to be a calorie slam. This treat is mostly made of fruit so it is ideal for the diet conscious. It is perfect for when you need something just a little sweet to help you through the afternoon. It has certainly helped me get through the past year. I have been in the Weight Watchers program and finally reached my goal weight yesterday! It has taken a little longer than expected; starting a dessert blog part way through hasn’t helped! Anyway, it’s so easy … remove the pip from a fresh medjool date and insert one small square of dark chocolate (I used Green & Black’s 85% cocoa chocolate). Pop in the microwave for about 10 seconds, just enough to soften the chocolate. One is enough … really. Posted in Sweet TreatsTagged dates, diet, easy cooking, easy dessert, egg free, gluten free, lactose free, nut free, vegan, vegetarian, Weight WatchersBookmark the permalink. What a terrific idea…thanks for posting. 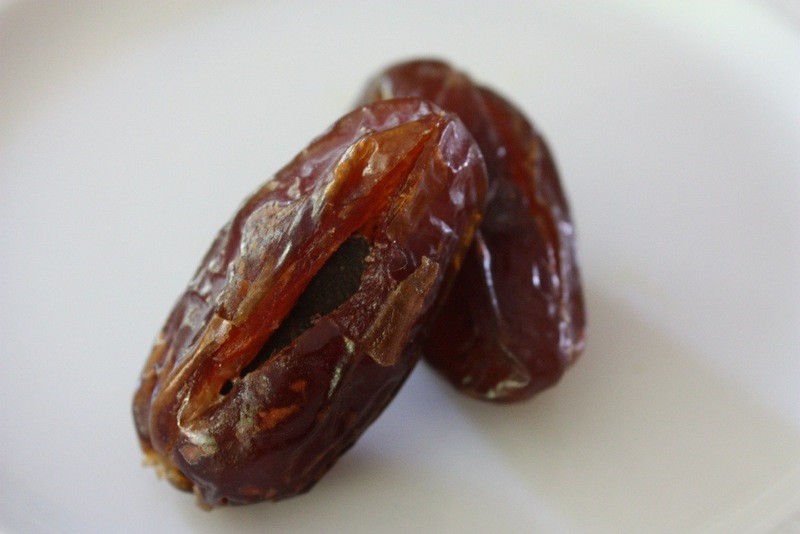 I discovered another delicious date treat last year at an Xmas party. Remove seed from date and fill in with about a tsp. of soft goat cheese. Delicious! What a great idea – just perfect for the cheeseboard.